I couldn’t be a vegetarian either. Meat calls to me. Also can’t blame you for caving into Wendy’s. I had some today, as a matter of fact. The Wendys Spicy Chicken sandwich I was craving yesterday was actually part of the inspiration for the story in this post, lol. this is one of the most beautiful photos i have ever seen on tastespotting- what a gorgeous recipe. Shayma – you’re very kind! Thanks for the compliments! Hey honey. It’s mom. The picture of the salmon is just beautiful. I actually have all of the ingredients for this dish and I think I will make it tonight. I will let you know how it goes. I will have to sub the creme fraiche with sourcream though. Just made this tonight– SO delish, and really quick! Excellent weeknight dinner. Materials used in this dish is very nutritious.Therefore, the dish should be both delicious and nutritious. 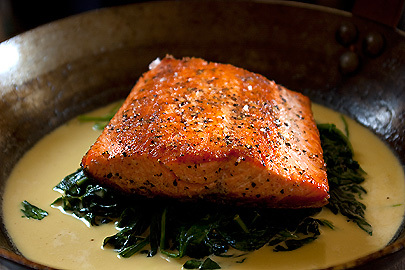 I often eat spinach, but do not always eat salmon. Thank you for this delicious recipe! Just made it tonight with kale instead of spinach. Starting a sugar and flour free regimen and recipes like this make it easy! I had salmon, had spinach but no creme fraiche but had greek yogurt that needed to be used up. I added a couple of teaspoons of brown sugar to the yogurt to take the acidic edge off and it turned out great. Many thanks!!! So I can’t have dairy, so I was thinking of trying a combination of vegetable stock and coconut cream. Do you think that would work?